Newtown Residents Join Gun Control Rally In Washington : The Two-Way The gun control rally Saturday on the National Mall was organized after the shootings at Sandy Hook Elementary, where 20 children died. Newtown, Conn., residents Darren Wagner and Georgia Monaghan traveled to Washington, D.C., to attend the gun control rally on Saturday. About 100 residents were expected from Newtown, The Washington Post says. 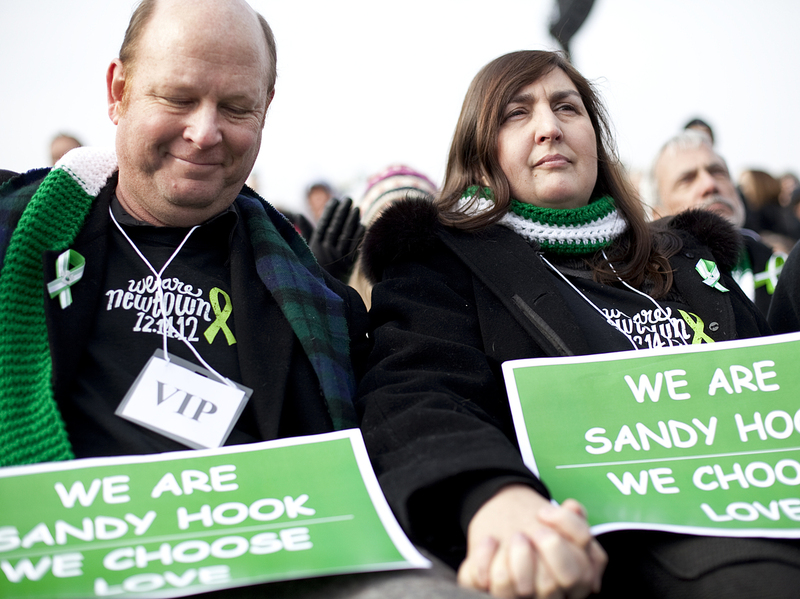 The march was organized in the wake of the shootings at Sandy Hook Elementary, where six teachers were also killed. Joan Huskins, the mother of four children who graduated from the school, took a bus to Washington, D.C., to support her neighbors. "I'm here to share my strength for those who couldn't make it today," she said. As they walked from the reflecting pool on Capitol Hill to the Washington Monument, many marchers carried signs with the names of victims of gun violence. Pat Potter of Virginia carried a sign reading, "Born to teach, not to shoot." She said she's horrified at those who want to see teachers armed. "The last thing we need is more guns in school," she said. "Our job as teachers and parents and as a society is to protect children and keep them safe." The marchers want a ban on military-style assault rifles and universal criminal and mental health background checks on would-be gun buyers, among other things.